Instant Search is the way to perform precise and fast search within Outlook 2007 mails, tasks, contacts, etc. You can also use it to perform full text search within work items even if you are offline. Searching arbitrary text is easy. Just select query folder and type word or phrase you want to search. Searching for the text within specific work item fields is somewhat more involved, but is also very easy, as we will demonstrate shortly. Purpose of this text is to demonstrate both approaches. 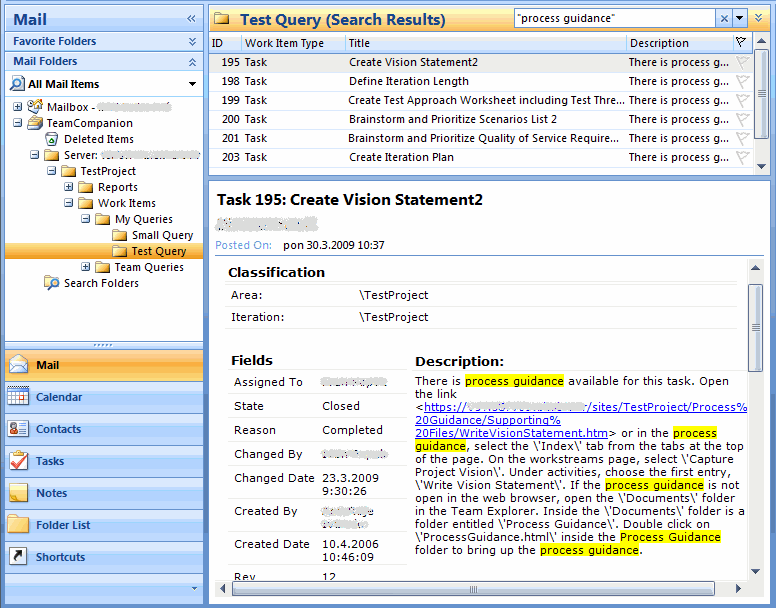 The result is as expected; search result consists of work items that contain the phrase „process guidance“. Let's suppose that we want to restrict our search to some specific work item fields and not all of them. To accomplish that, search queries must be used. Generally, search queries have the following form: keyword:search criteria value. When searching within a single field, keyword is the name of the field and search criteria value is the phrase that field must contain for the item to appear in the search result. In the case of TeamCompanion, basic search query has the following form: [Tfs:work item field name]:search criteria value. Work item field name is the name of the column in query view and search criteria value is the phrase to search. 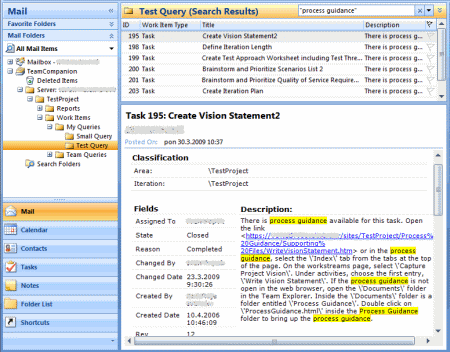 Note that work item field must be added as column in order to be used for search (to add columns, right-click query folder and click „Customize View“). Square brackets are required because TeamCompanion prefixes work item field names with „Tfs:“. Since colon is used by the Instant Search as the separator between keyword and search criteria value, we must tell Instant Search that colon in Tfs:work item field name is not separator. To do this we enclose Tfs: work item field name with the square brackets. Search results now consist of work items that have the phrase „Set up“ in their Title field. That's it! As you can see, searching work items is easy. VSTS Dev and DB Editions joined together!